2.Prepare Cilantro-Lime Chimichurri: In small bowl, whisk together garlic, jalapeño, cilantro, lime juice, mustard, sugar, salt, pepper and cayenne; slowly add oil while whisking constantly. 3.Prepare Lettuce Wraps: Coat steak, corn and onion with oil; sprinkle with steak seasoning. Place steak, corn and onion on hot grill rack. Cook corn and onion 3 to 5 minutes, turning frequently to brown all sides or until lightly charred; transfer to cutting board. Cook steak 10 to 12 minutes or until internal temperature reaches 145°F for medium doneness, turning once halfway through cooking. Transfer steak to cutting board and loosely cover with aluminum foil; let stand 5 minutes. 4.Cut corn from cob and thinly slice steak across the grain. 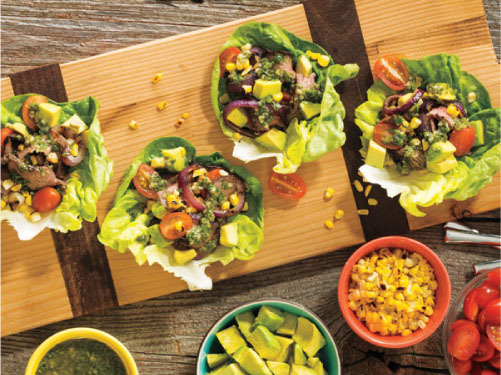 Serve steak topped with onion, corn, avocado and tomatoes in lettuce leaves drizzled with chimichurri. > Try Mrs. Dash® Steak Grilling Seasoning to make this recipe low-sodium! > Avocados contain healthy fats, which help make this meal not only delicious, but also filling!